Since I’m sitting at the computer sweating at 10:30PM I thought I’d post about our recent trip to Tasty Treat in Ashland. 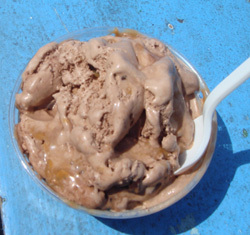 This is one of our top picks when it comes to going out for an ice cream. I guess there’s nothing too special about it but it’s a nice place to go for an ice cream and although we haven’t played it, they offer mini golf and you can sit on the benches and watch people play. Ethan got some sort of peanut butter ice cream and I got a German Chocolate Cake, which is my favorite here and that’s what I usually get everytime. They don’t seem to have a website but they’re at 16 W. Union St. (Rt. 135) and are open year round but obviously summer is their time to shine. I took a look at their minigolf course recently as I was planning a group outing for a bunch of friends, but theirs is very poor, both in design and maintenance. I suppose if you’re going for the ice cream anyhow, but we ended up at Trombetta’s in Marlboro for our minigolf and icecream trip. 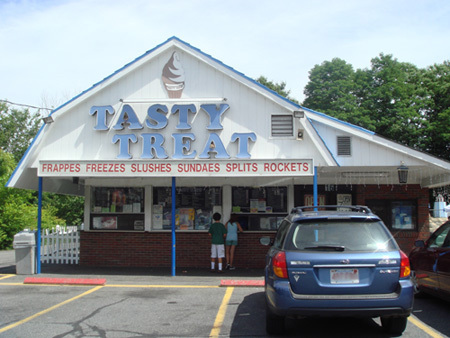 Reading about Tasty Treat brought back a lot of memories because back in the 1990s when New Covenant Christian School was still located in downtown Ashland (it’s now in Marlborough) my wife Mary Ann was the Kindergarten teacher and EVERY first day of school she’d take her class on a field trip to Tasty Treat! I’d always find some excuse to join them! The last time I played mini-golf there was about ten years ago. It may not be the greatest course but it’s a fun place to take little kids. Right now I’m a little sad because my youngest is 21 and those days are past for me! 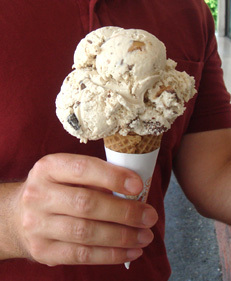 German chocolate cake ice cream? Yum! M Mosher HHS ’92 Used to Work Here!! I went Yesterday with my kids,t he course is beat, bad rugs, sticks everywhere. I used to go to the old course when you could win a free play on the last hole. I won’t be back.